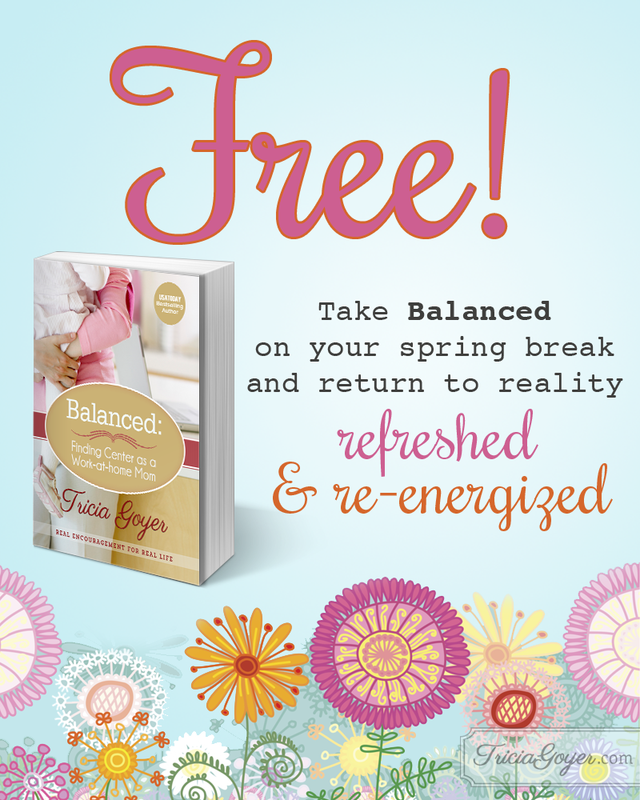 I wrote the book Balanced, yet I love how God is able to use my own words to help and inspire myself! As I’ve written blogs based on the book, it’s given me a chance to rethink some of the concepts. Every season of life is different, and I’m even in a new season since the nine months when I wrote the book! These are things I was reminded of—important thoughts that transformed my schedule. 1. Take time to ponder where you’re falling short. On my current Fail! and Yeah! List I identified that while I was giving a lot of attention to my little kids, it was easy to ignore the older ones. It worked out that I was able to go on a road trip to Nashville, and my nineteen-year-old went with me. We chatted on the drive. We went to a concert, and we enjoyed being together! If I hadn’t stopped to ponder where I was falling short, I would have missed out on the memories I was able to make with Nathan. When I think about where I’m falling short, I can make plans to succeed. 2. Take time to build teamwork in your family. I’d had been slacking on working with my children concerning chores. I knew it would be a lot of work. IT IS! Yet they are so excited to help and to be part of a team. If I hadn’t done this challenge I probably would have let my little kids slide for while longer (months? a year?). Yet when I was reminded of the importance of building a family team, I made creating a chore time schedule a priority. When I think in terms of “teamwork” it changes how I/we work around the home. 3. Take time to prioritize. When my to-do list gets too full, it gets easy to want to give up. When I pick the “most important thing” and do that, it’s amazing what can get done. When I think about “what’s most important,” I understand my next steps. 4. Take time to praise. I love God but so many times I forget to thank Him for ALL things. My husband is traveling this week, which means life is harder for this momma. Yet when I praise God for the kids, the mess, and even the weariness, I’m reminded that God sustains me. When I think about God, it makes it easier to ask Him for help throughout the day. What about you? 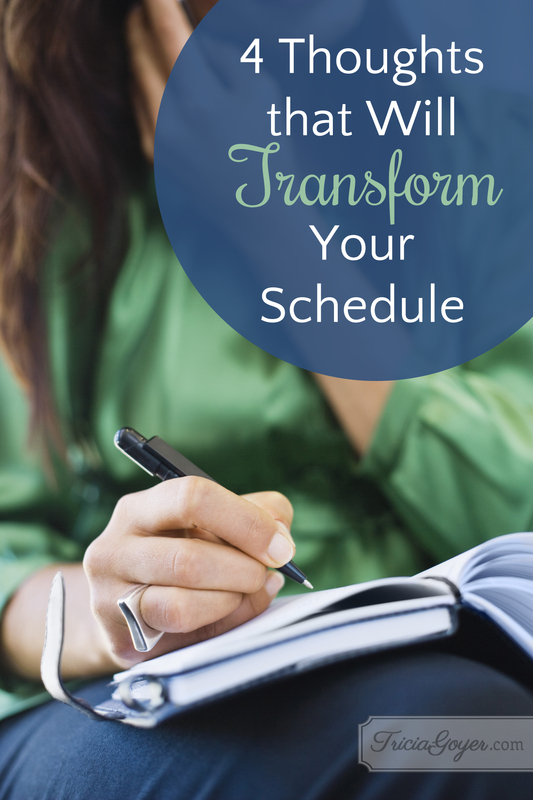 How do your thoughts transform your schedule? Write down three steps you can take to get your thoughts moving in the right direction. Thank God for the way He created our minds to work. Ask Him to guide your thoughts today, knowing they will transform your actions! I know my thoughts are like the wind that moves the sail of my actions. When my thoughts blow in a positive direction, I steer in the right direction. Lord, help me control my thoughts today in a way that will positively impact my life and my family!